Facebook might not admit that its fake news makes a lasting impact on the social decisions at mass. 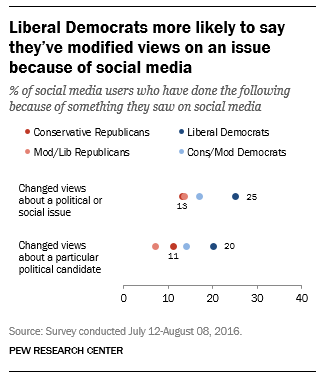 In any case, late discoveries from the Pew Research Centre recommend the inverse is true, as 20 percent of web-based social networking users say they’ve changed their position on a political issue in light of something they saw on locales like Facebook. The move was typically critical. 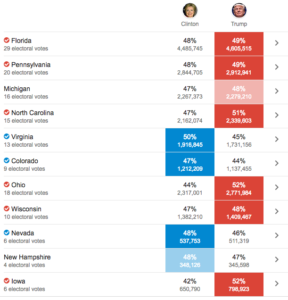 “Individuals who said they had altered their opinions on [the presidential] hopefuls regularly said that social network pointed their assessment in a more negative heading,” Pew research relate Monica Anderson said in a post in regards to the overview that was distributed Monday. “Respondents who demonstrated they had altered their opinions about Clinton were more than three times as prone to state that their feeling altered in a negative course as opposed to a positive one (24% versus 7%), and respondents who said Trump were about five times as liable to state that their conclusion turned out to be more negative rather than more positive (19% versus 4%),” she included. The discoveries are pulled from more broad Pew research on legislative issues and web-based social networking that was distributed a month ago. The reviews behind that research were finished not long ago, much sooner than Election Day, so it’s difficult to state with any sureness that moving assessments converted into political activity. Still, the accounts gathered by Pew strengthen the intelligent idea that a few people are affected by the data they see on the web. Take note of that none of the reactions incorporated into Pew’s report demonstrate that the people overviewed had been presented to — or influenced by — fake news reports. Indecency, that is fairly unimportant: The question is on a very basic level about whether individuals can be affected by data they see via web-based networking media. On the off chance that the answer is yes, then we ought to have confidence in the force of viral fabrications when they spread via web-based networking media. With changing safety buffers, Pew’s specimen, at a 95 percent level of certainty, included 3,571 social media users, 3,163 of which were Facebook users. 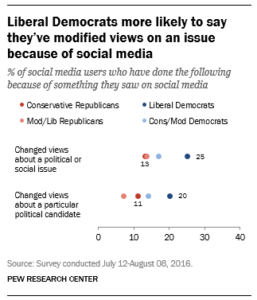 Of that populace of social media users, 1,557 said they were Republican or Republican-inclining, while 1,929 were Democrats or inclining in that heading. Self-distinguished liberal Democrats were well on the way to state they’d altered their opinions on a political or social issue due to something they saw via web-based networking media, at 25 percent in general. Thirteen percent of moderate Republicans said the same. 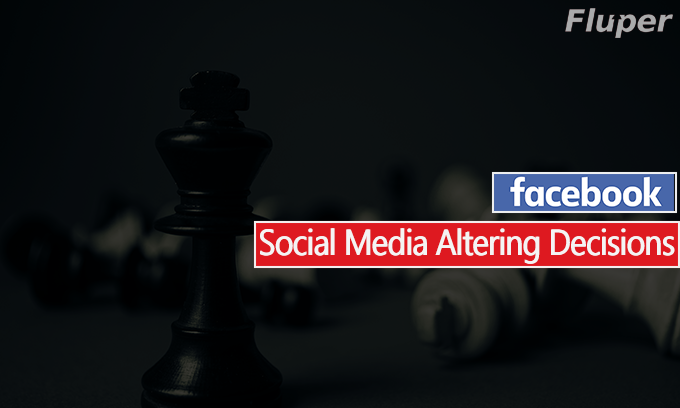 Additionally keep in mind, that an enormous majority of people, about 82%, said that they didn’t change their opinion because of social media. The race for the presidential election was incredibly amazing as per Google trends.